How gorgeous do these women look? This fabulous line-up occurred at the finale of The Old Ladies’ Rebellion’s recent catwalk show. No towering heels, just towelling slippers (and espadrilles). Screen-printed silk dresses with sleeves, elegant trousers and neat edge-to-edge jackets. Fashion for all ages. Perfect. 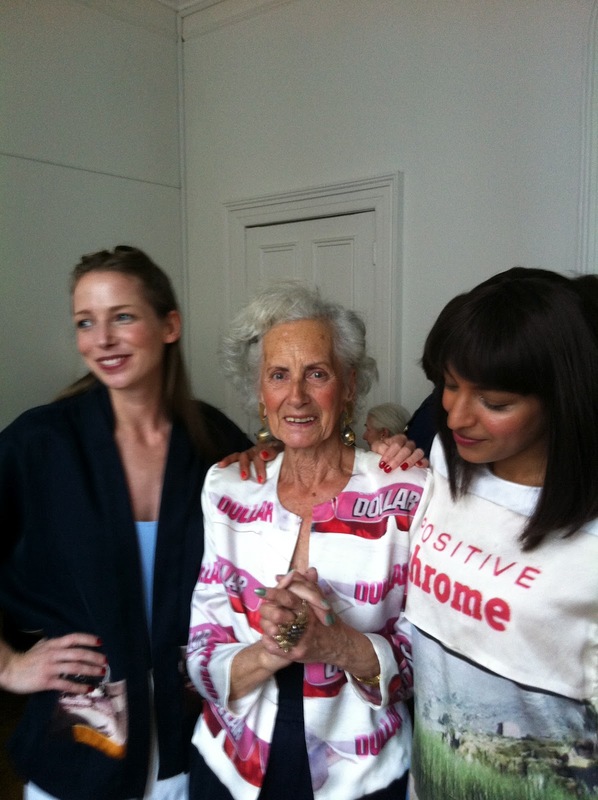 with the French-born designer Fanny Karst about her latest collection. 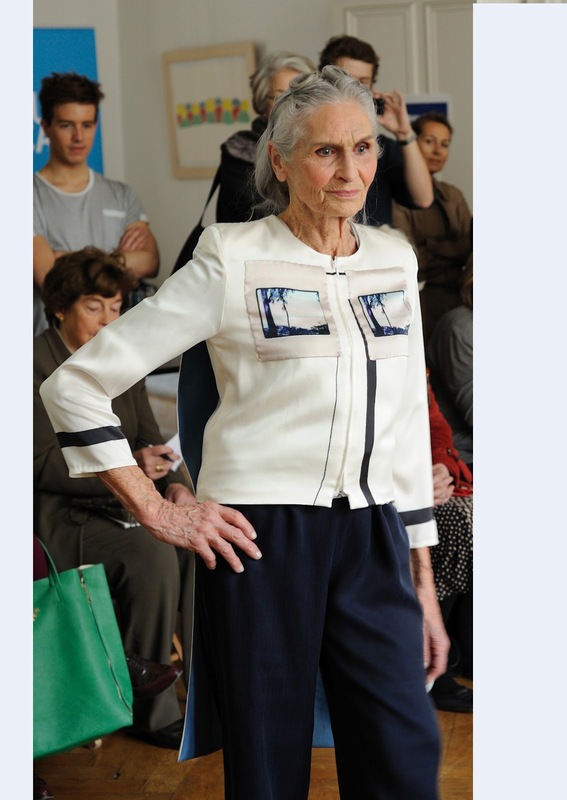 TNMA: What should rebellious old ladies be wearing this year? TNMA: What considerations do you make when designing for older women? 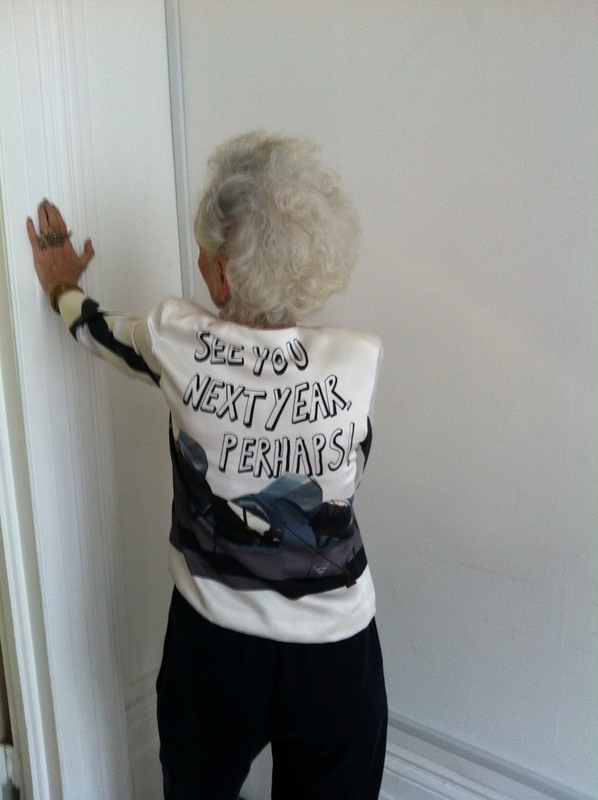 The fabulous ‘See you next year, perhaps!’ bomber jacket. TNMA: So where does the name Old Ladies’ Rebellion come from – and does it put younger customers off? TNMA: Who would you like to see wearing your label? TNMA: And what about old ladies like me who can’t afford designer clothes? Sounds good to me, think I need to take a closer look. too too cool…and an inspiration bravo!! Wonderful, wonderful! I'm not quite there yet, but seeing all this fabulousness at "that certain age" makes me look forward fearlessly! What a great collection, and don't the models all look amazing. The bomber jacket is awesome. I love this, especially the bomber jacket! Love this post…so packed with inspiration and ladies of fabulous style!! This is wonderful. I especially love the graphics and patterns. Thank you for honoring the hip crowd! What an honour to attend, I would have loved this. The whole thing makes me smile and there are a few outfits there I would love to own. How wonderful. All the models look amazing. I would love to know more about the collection. Do you know if it is available anywhere in the UK? 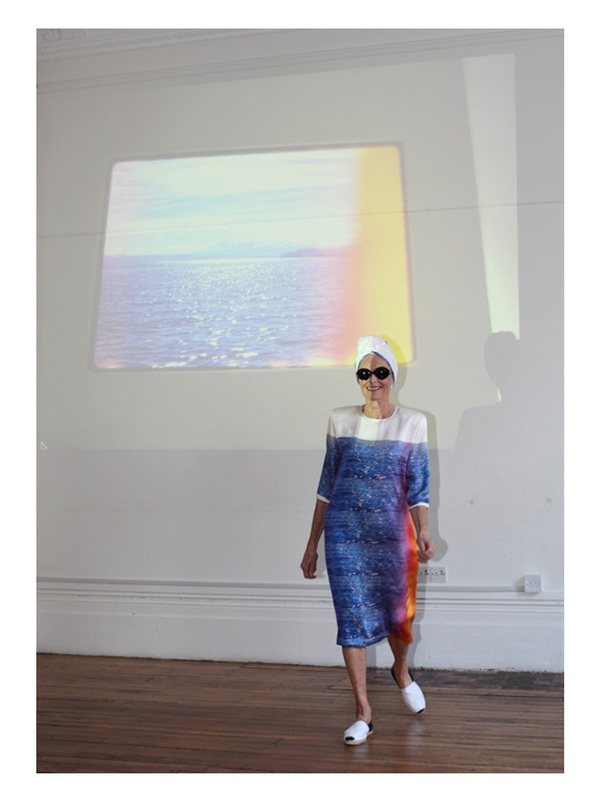 Fanny Karst´s label had excellent pieces of clothing! And I especially liked the one model, with straight hair. Now she looked perfect; just a bit of smashing jewelry. That´s it. All the women were in slim fit too! Fantastic… I really enjoy this post. I would like to sugest you an interesting design brand called Delightfull, all the lamps are inpired in soul and jazz artists. I hope you enjoy it and congratulations for your amazing blog. The Old Ladies Rebellion! Now that's a concept to live by and embrace. Fabulous post! They all look great, esp the blue colour block shift dress – with sleeves! So cool! I love it. Inspiration! Fantastic! What an inspiration. There's no excuse for anyone to look dowdy! 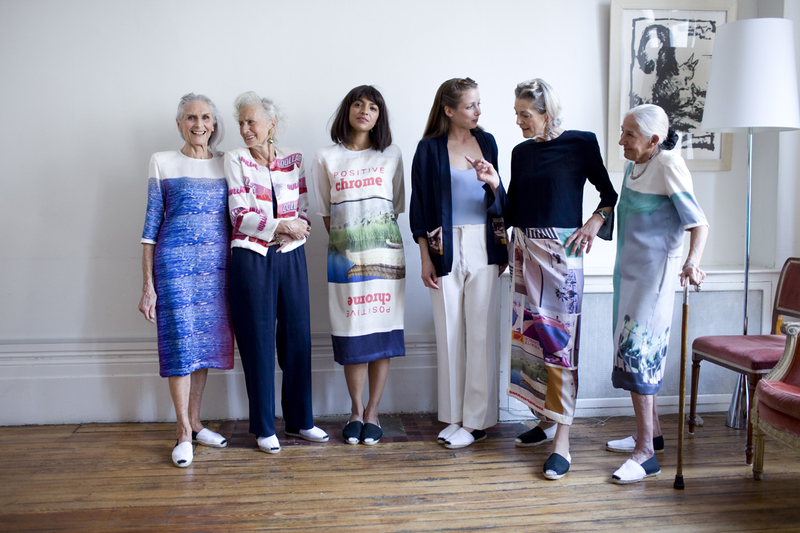 This is GREAT…I love it and these ladies look fabulous! 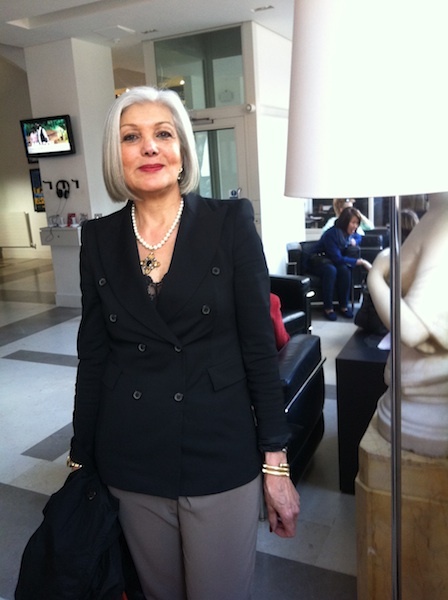 I am currently working on a master's degree in Gerontology (I'm 51). I'm bookmarking this post and somehow, I'm going to include some kind of reference this event and style issues in general relating to older women. Not sure how yet…but I'll figure it out as I go! "See you next year, perhaps" — love that. BTW, are you in London or nearby? Cashmere Lounge offers beautiful quality cashmere clothing made from 100% pure cashmere. We sell shawls, cashmere loungewear, hats, slippers. Truly inspiring! I love the clothes – the prints are fabulous! The bomber jacket rocks! It's chick and philosophical. Thank you for that post. It's brilliant. How gorgeous do these women look? This fabulous line-up occurred at the finale of The Old Ladies’ Rebellion’s recent catwalk show.